Faraday the Blob » Archive » Vote Early, Vote Often, Vote Elf! 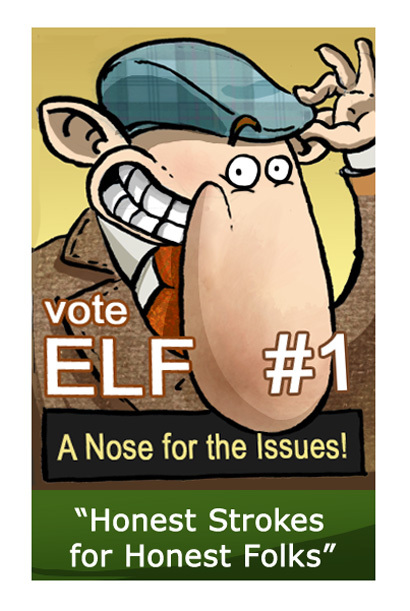 Vote Early, Vote Often, Vote Elf! It’s an important day – get out there and do it! This entry was posted on Friday, February 25th, 2011 at 6:02 pm and is filed under Comics. You can follow any responses to this entry through the RSS 2.0 feed. You can skip to the end and leave a response. Pinging is currently not allowed. He fixed the road! HE FIXED THE ROAD! he has the cap but where is his horse? Pappamick - horse outside, of course… Haven’t you heard the song? The song is great! Figured out the horse was outside. one vote from me!!! !there ya go!!!!!! !